Cruisers, racers, and multihulls; sleek ocean racing machines, alongside comfortable family cruisers; superyachts with professional crews, and excited couples living the dream - these were the boats and sailors departing Las Palmas de Gran Canaria today to start the 33rd Atlantic Rally for Cruisers (ARC). Bound for the Caribbean island of Saint Lucia, today's departure is the beginning of an exciting adventure crossing the Atlantic Ocean. For many, it is the culmination of years of planning, months of preparations and weeks of checking off the jobs lists. The final days in Las Palmas Marina have been full of excitement and anticipation as crews have loaded provisions and made last minute equipment fixes. Experienced ocean sailors from ARC organisers World Cruising Club have helped ensure the crews are well prepared with a pre-departure programme of seminars and safety checks, and a social programme of nightly gatherings has meant crews have got to know each other well, enjoying the camaraderie of setting sail together. 22 race boats were certainly less patient, eagerly positioning themselves at the start. Performance Yacht Racing's Beneteau First 47.7 EH01 was expertly manoeuvred by skipper Andras Bakody to cross the line first, swiftly followed by the Russian Mobile 53 Annathen class favourites Scarlet Oyster. 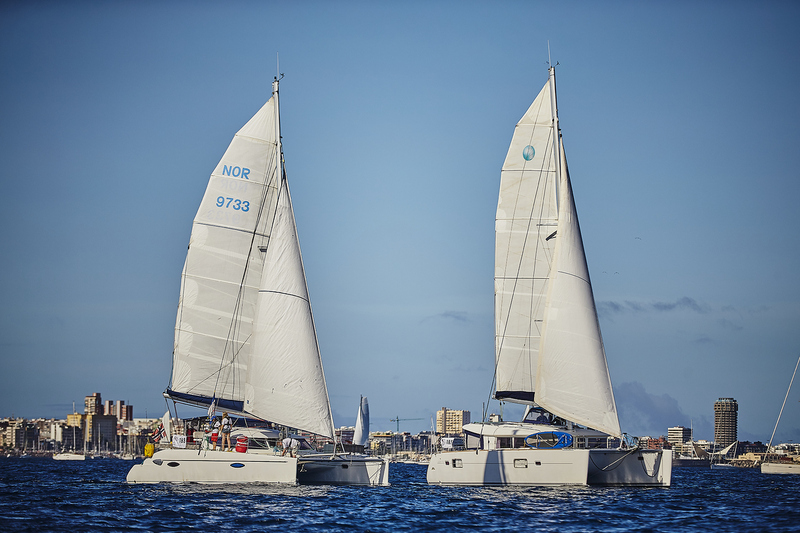 Spinnakers and gennakers were put to full use as the racers gybed out to seaward and away from the coast of Gran Canaria to find clear air away the land affected coastal winds. In tandem with the ARC's Gran Canaria departure today, the ARC+ St. Vincent fleet waved goodbye to Mindelo São Vicente in Cape Verde. Following a brief stopover breaking their transatlantic journey, they have begun their own crossing to Blue Lagoon Marina in St. Vincent.